The primary purpose of this book is to capture the state-of-the-art in Cloud Computing technologies and applications. The book will also aim to identify potential research directions and technologies that will facilitate creation a global market-place of cloud computing services supporting scientific, industrial, business, and consumer applications. We expect the book to serve as a reference for larger audience such as systems architects, practitioners, developers, new researchers and graduate level students. This area of research is relatively recent, and as such has no existing reference book that addresses it. This book will be a timely contribution to a field that is gaining considerable research interest, momentum, and is expected to be of increasing interest to commercial developers. The book is targeted for professional computer science developers and graduate students especially at Masters level. As Cloud Computing is recognized as one of the top five emerging technologies that will have a major impact on the quality of science and society over the next 20 years, its knowledge will help position our readers at the forefront of the field. Rajkumar Buyya is a Professor of Computer Science and Software Engineering and Director of Cloud Computing and Distributed Systems Lab at the University of Melbourne, Australia. He also serves as CEO of Manjrasoft creating innovative solutions for building and accelerating applications on clouds. James Broberg is an Australian Postdoctoral Fellow with the Cloud Computing and Distributed Systems Laboratory at the University of Melbourne. Andrzej Goscinski is a Chair Professor of Computing at Deakin University, Australia. 1. 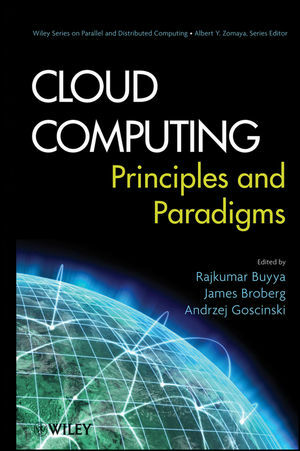 Introduction to Cloud Computing (Willliam Voorsluys, James Broberg, and Rajkumar Buyya). 2. Migrating into a Cloud (T. S. Mohan). 3. Enriching the “Integration as a Service” Paradigm for the Cloud Era (Pethuru Raj). 4. The Enterprise Cloud Computing Paradigm (Tariq Ellahi, Benoit Hudzia, Hui Li, Maik A. Lindner, and Philip Robinson). Part II. Infrastructure as a Service (IAAS). 5. Virtual Machines Provisioning and Migration Services (Mohamed El-Refaey). 6. On the Management of Virtual Machines for Cloud Infrastructures (Ignacio M. Llorente, Rubén S. Montero, Borja Sotomayor, David Breitgand, Alessandro Maraschini, Eliezer Levy, and Benny Rochwerger). 7. Enhancing Cloud Computing Environments Using a Cluster as a Service (Michael Brock and Andrzej Goscinski). 8. Secure Distributed Data Storage in Cloud Computing (Yu Chen, Wei-Shinn Ku, Jun Feng, Pu Liu, and Zhou Su). Part III. Platform and Software as a Service (PAAS/IAAS). 9. Aneka—Integration of Private and Public Clouds (Christian Vecchiola, Xingchen Chu, Michael Mattess, and Rajkumar Buyya). 10. CometCloud: An Autonomic Cloud Engine (Hyunjoo Kim and Manish Parashar). 11. T-Systems’ Cloud-Based Solutions for Business Applications (Michael Pauly). 12. Workflow Engine for Clouds (Suraj Pandey, Dileban Karunamoorthy, and Rajkumar Buyya). 13. Understanding Scientific Applications for Cloud Environments (Shantenu Jha, Daniel S. Katz, Andre Luckow, Andre Merzky, and Katerina Stamou). 14. The MapReduce Programming Model and Implementations (Hai Jin, Shadi Ibrahim, Li Qi, Haijun Cao, Song Wu, and Xuanhua Shi). Part IV. Monitoring and Management. 15. An Architecture for Federated Cloud Computing (Benny Rochwerger, Constantino Vázquez, David Breitgand, David Hadas, Massimo Villari, Philippe Massonet, Eliezer Levy, Alex Galis, Ignacio M. Llorente, Rubén S. Montero, Yaron Wolfsthal, Kenneth Nagin, Lars Larsson, and Fermín Galán). 16. SLA Management in Cloud Computing: A Service Provider’s Perspective (Sumit Bose, Anjaneyulu Padala, Dheepak R A, Sridhar Murthy, and Ganesan Malaiyandisamy). 17. Performance Prediction for HPC on Clouds (Rocco Aversa, Beniamino Di Martino, Massimiliano Rak, Salvatore Venticinque, and Umberto Villano). 18. Best Practices in Architecting Cloud Applications in the AWS Cloud (Jinesh Varia). 19. Massively Multiplayer Online Game Hosting on Cloud Resources (Vlad Nae, Radu Prodan, and Alexandru Iosup). 20. Building Content Delivery Networks Using Clouds (James Broberg). 21. Resource Cloud Mashups (Lutz Schubert, Matthias Assel, Alexander Kipp, and Stefan Wesner). Part VI. Governance and Case Studies. 22. Organizational Readiness and Change Management in the Cloud Age (Robert Lam). 23. Data Security in the Cloud (Susan Morrow). 24. Legal Issues in Cloud Computing (Janine Anthony Bowen). 25. Achieving Production Readiness for Cloud Services (Wai-Kit Cheah and Henry Kasim).